This is one more game from Cartoon Networks. The real nightmare has started! Real zombies have attacked a screening of Zombocalypse 3D and now Mordecai and Ribgy are to protect the audience. Help them in their fight! 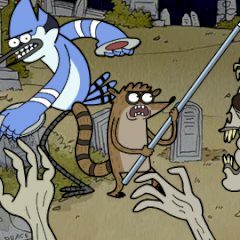 Throw shot puts, discuses, and bombs as Mordecai or use Rigby's javelin to wipe out the zombie horde. Do not let them reach the audience!